We recently updated our chandelier. It used to have a bronze finish, but I quickly got tired of it, so I decided to paint it glossy white in an attempt to make it more modern. 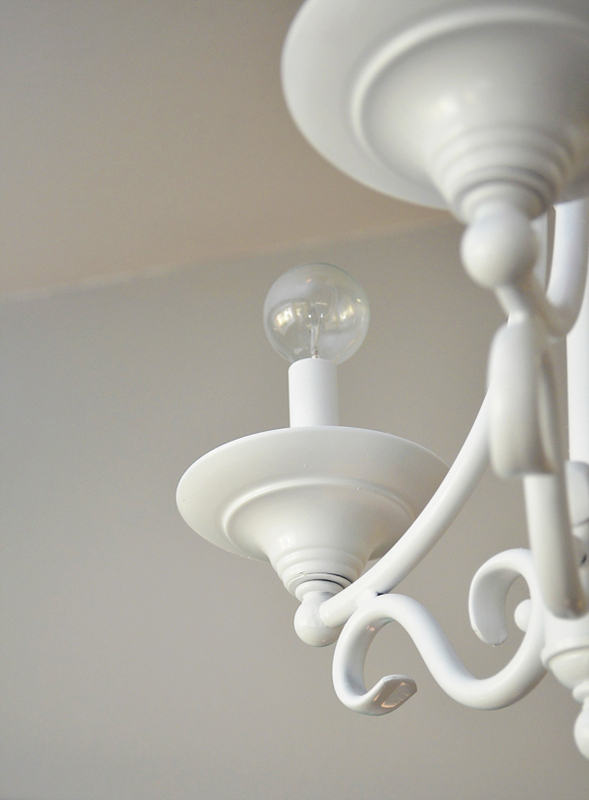 I also added these round little lights instead of the typical chandelier light bulbs. You know, the ones that look like little candle flames? I figured a good way to update it was to use unique light bulbs. I think the combination of the white glossy paint and the round light bulbs make it a little more modern. Yes? If I had my way though, I would get an ultra modern light fixture, but they're a little too expensive for the time being. So the update will have to do for now. This is what I have my eye on. The lamp from Dylan Design Company, on the left, is by FAR my favorite, and I want it SO much, but it's a dream. It's $950 and out of my price range. I love the shape of the lamp from CB2 but I wonder how much light it will give off since the shade is black. The chandeliers above aren't for sale as far as I can tell, but I LOVE them. The balloon lights by CoursCalogero, on the left, have a chain on the bottom that you pull to turn them on. It doesn't get any more whimsical than that! The chandelier on the right, by Pani Jurek, is made out of test tubes in a circular plywood band. Seems pretty DIY-able, except I don't know where to find a plywood band. I suppose you can make one yourself with the right tools. I love the idea of changing the colored water whenever you feel like a change. I want one! 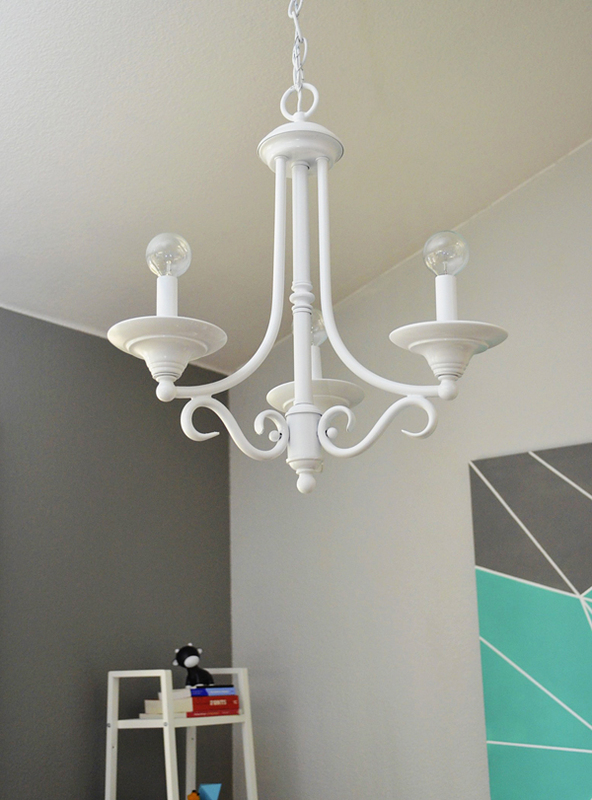 When you painted the chandelier, how did you prep it? I have a gold chandelier I want to spray paint, but don't know how to prep it or if it needs prepping. Thanks! I love the little round bulbs too! Hi Becca, I just cleaned it off with a cleaner and then sprayed a coat of primer on it. After that dried, I added a few coats of glossy white spray paint. You can probably sand it a little to make the paint stick better, but I thought it was unnecessary since the chandelier is never going to be handled. I love round light bulbs! There are a lot of cute light bulb options out there. Hi Becca, where did you find the darling chandelier bulbs?